LOS ANGELES, May 23, 2018 /PRNewswire/ -- The Ohio State University took home first place in the final year of EcoCAR 3, an Advanced Vehicle Technology Competition, sponsored by the U.S. Department of Energy (DOE) and General Motors Co. This is the fourth consecutive win for the team. "EcoCAR 3 exemplifies DOEs commitment to STEM education and supporting the next generation of American innovators," said Energy Secretary Rick Perry. "The creativity and talent displayed by the students in the EcoCAR 3 competition is what will keep America's transportation sector moving forward." In addition to the coveted first place trophy and bragging rights, the Buckeye's will also take home an extra $10,000 to further support the university's advanced vehicle technology program. The team earned 895 out of 1000 overall points. EcoCAR 3 is the latest Energy Department Advanced Vehicle Technology Competition (AVTC) series and challenges 16 North American university teams to redesign a 2016 Chevrolet Camaro to further reduce its environmental impact, while maintaining the performance and safety expected from this iconic American car. Teams spent the last four years (2014-2018) harnessing those ideas into the ultimate energy-efficient, high performance vehicle. "EcoCAR3 is a great program that fosters future generations of automotive engineers and business people, encouraging them to become true innovators," said Ken Morris, General Motors Vice President of Global Product Programs. "This year's winners – and all the teams – are proof of that. It's a competition that GM is proud to support." 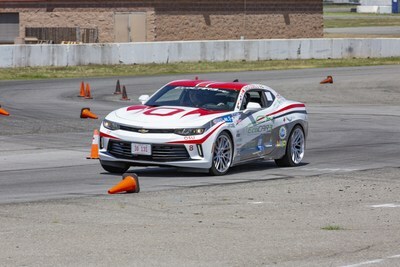 Following presentations, teams hit Los Angeles roads for a 150-mile over-the-road event where the Chevrolet Camaros were scored based on performance with everyday driving applications. At the end of the second week, students had the opportunity to display their completed hybrid-electric Chevrolet Camaros with a car show at Hollywood's famed Magic Castle. West Virginia finished with 817 total points taking second place, and the University of Alabama received 784 points in third place. EcoCAR 3 is a four-year collegiate engineering program that builds on the successful 30-year history of the Department of Energy (DOE) Advanced Vehicle Technology Competitions (AVTC) by giving engineering students the chance to design and build vehicles that demonstrate leading-edge automotive technologies. General Motors provides each of the 16 competing teams with a 2016 Chevrolet Camaro, as well as vehicle components, seed money, technical mentoring and operational support. The DOE and its research and development facility, Argonne National Laboratory, provide competition management, team evaluation and logistical support. Through this important public/private partnership, EcoCAR 3 provides invaluable experience and training to promising young minds entering the North American job market.